Washington has beautiful summers. No humidity, mild temperatures, clear blue skies, and very little rain during their sweet (albeit short) summertime. But nothing, nothing, compares to summer in the south! It's the quintessential summer, the summer of my dreams, a summer that lets me recapture that feeling, that magic of long ago childhood summers. Where the days were endless and you could do anything you wanted as long as you were home by the time the fireflies came out. You lose a little bit of that magic when you get older and no longer have a proper summer vacation. And you lose it even more when it's only 55 degrees in the morning and you can comfortably wear jeans in the middle of July, and you haven't felt the relief of air-conditioner after coming in from the steamy outdoors in about two years. I flew to South Carolina a few days before T.J. got off to enjoy a little extra time with my family. Stepping off the plane and being hit by that wall of humidity felt like home! It's not summer if you can't complain about the heat so after lunch with my mom and sister we of course had to treat ourselves to a sno-ball! That night we went to one of my favorite restaurants in town to celebrate all being together (minus T.J.) for the first time since Christmas. 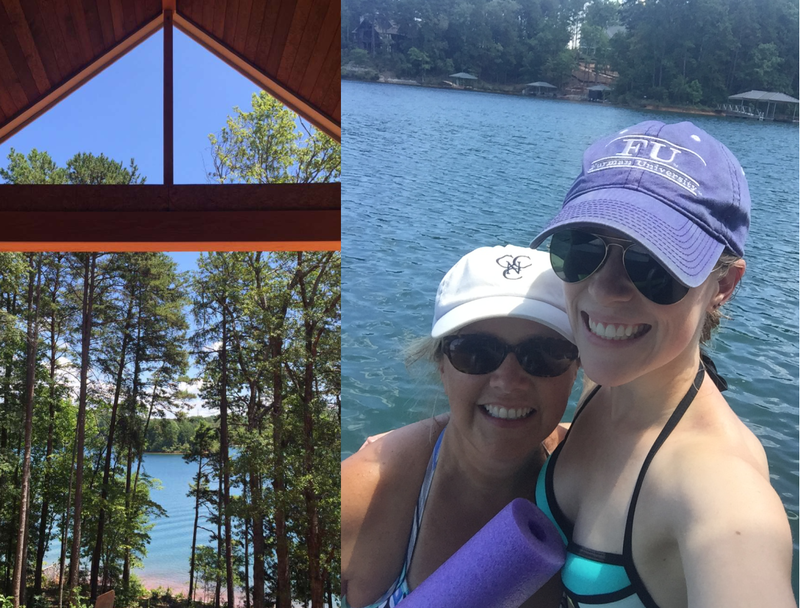 My sister is a beach body coach and had already planned to go to the big conference the next day so while I was sad to miss out on a couple days with her, I was super excited to go out to the lake with my parents. If you follow my mom's blog you know they are in the process of building their dream house on a lake in the upstate of South Carolina. When I was home at Christmas only the foundation had been poured and now it's finally looking like a real house with walls and windows and everything! I am beyond excited for this house, this new home base. My parents are planning to stay put for a good long while now and I can't wait to fill this home with years and years of memories. I have the clearest picture in my head of future visits with naps on the screened in porch, barefoot babies in adorable baby life jackets running around the dock, waterskiing with my dad, taking the boat back and forth between their house and my in-laws house. My parents walked me all through house and I picked out my future room and then we picked paint colors. Before too long I was way too hot and sweaty and I had to take my inaugural jump in the lake, the perfectly clear blue lake that I now refer to as "our lake". The water is so flipping warm so I literally stayed floating on my noodle for about 2 hours turning into a prune until we decided to take the boat out. 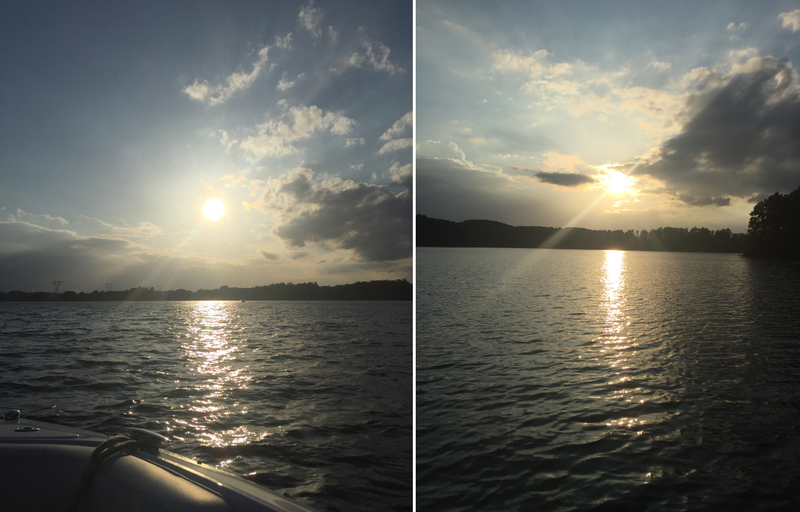 We grabbed dinner dockside and enjoyed our sparkly sunset ride back to the house. The next couple of days we got more snoballs, lazed by the pool, took a walk around my Alma mater, reapplied a lot of sunscreen, had BBQ with my cousin and aunt and uncle, and stopped by my in-laws house so I could meet their goats! T.J. was supposed to get in Saturday afternoon but due to bad weather and flight complications he didn't make it in until much later that night. And even though his suitcase didn't make it, all he needed was a swimsuit because the next day we headed back up to the lake for more fun on the water. We dropped our stuff off at his house and then took the boat over to my parents dock so T.J. could see the progress and so we could meet up with my sister and her boyfriend.We had a big dinner with both sides of the family and ended the night playing corn hole and darts and then jumping in the lake once the sun set. The next day T.J. and and I and his folks cruised around the lake some more and made a stop by the waterfall which was a nice relief because, unlike the rest of the lukewarm lake, the water is actually cold and refreshing. We spent the rest of the afternoon napping and reading and then my parents again for dinner on the lake. We slept in again on Tuesday and then just the two of us went out for ride together on the boat before it was time to head back in to town. We had dinner out that night and walked around downtown and grabbed ice cream and made several Pokemon Go players stop to snap a couple family photos for us. The next day I went furniture shopping with my mom and daydreamed about decorating my own lake house one day way way in the future. Then we had lunch at the cutest little hardware store turned cafe and I had a pimento cheese biscuit BLT and tomato okra soup- a lunch combo I could probably never find in Washington. 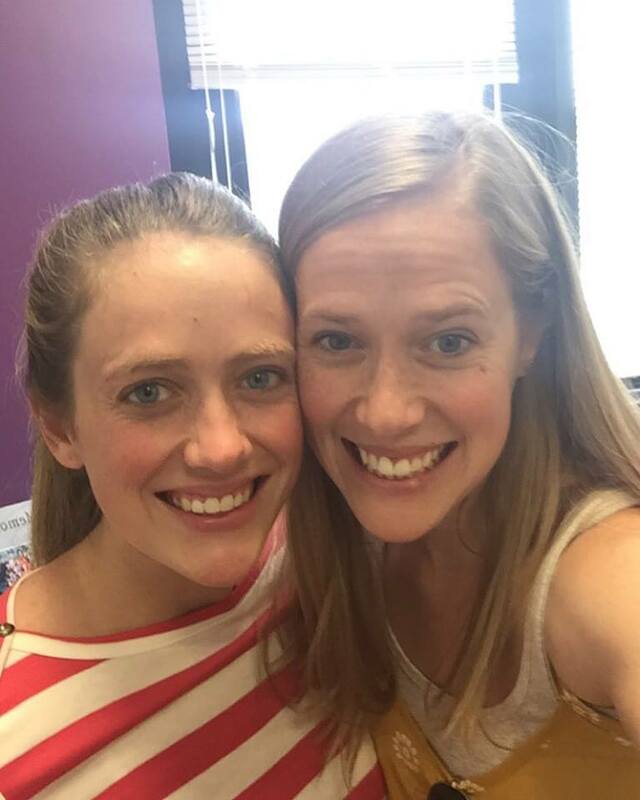 Afterwards we popped by my sister's school to check on the progress of her adorable kindergarten classroom-those are some lucky lucky little kiddos! Then I headed back to meet T.J., feed the goats again, and then go swimming at the pool at my parents apartment. We had one last big dinner with all of us together before tears and long hugs and heading out the next day. Why do these visits, that seem like a lot of days when you're planning them, always fly by in the blink of an eye? Why is Washington so dang far from our family? Fortunately our vacation wasn't over just yet which made saying goodbye a little bit easier on my heart. It was fun to re-live it here. Not as much fun as the actual living but still, your words and pics make me happy. 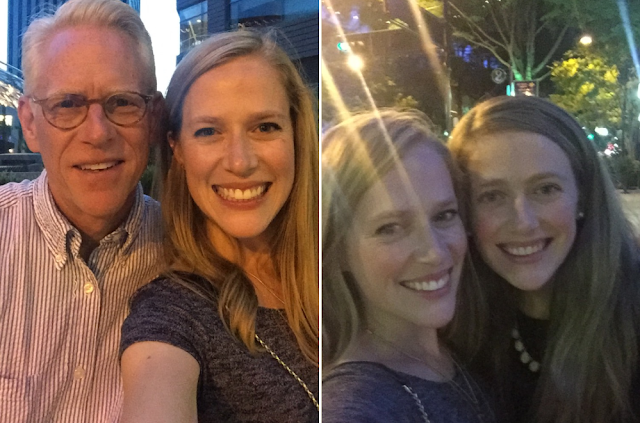 Loved the photos and hearing about your wonderful family-filled get-away! What a fun family vacay! I love the goat pics so adorable and you look amazing in that color block suit..wish I was brave enough to do pics in a swimsuit on my blog...! Looks like such a fun trip! And that house and your lake sound amazing! The perfect place to make tons of family memories! Ah what a great trip! Love your photos!! !